Unlike most map histories, this book is more about devices and techniques than about maps and atlases. Cartographic inventors who filed patents created clever products and processes intended to make map information easier to use—a cartographic variant of the better mousetrap. Their emphasis on the quotidian is apparent in the book’s individual chapters, which focus on admittedly mundane applications like streetcar transfers, rural address guides, mechanical route-following machines that anticipated the GPS, folding schemes, world map projections, and diverse improvements of the terrestrial globe. The final chapter, with an emphasis on you-are-here mall maps, relates early applications of electricity in interactive mapping to the rise of digital cartography and the emergence of patent trolls, for whom the patent is largely a license to litigate. Coverage begins in the mid-nineteenth century and extends through the pre-computer era, with additional narrowing in individual chapters as developments dictate. Except for noting the emergence of digital cartography in the final chapter, I avoid the complications of semiconductors and software, which demand a book of their own. In addition, my focus on patents awarded in the United States reflects a dearth of data on applications abandoned or rejected as well as the complexity of exploring patents issued in Britain, Canada, France, Germany, and Switzerland, among others. By concentrating on U.S. patents I could rely on complementary online databases maintained by the U.S. Patent and Trademark Office and by the Google Patents Project as well as pre-1975 case files in the National Archives at Kansas City. But because of an increasingly international market for intellectual property, non-U.S. residents figure prominently in the chapters on map folding and map projections. The book cover includes a drawing from Herman Schulse’s illuminated, electrically driven globe, patented in 1934. It also notes that the book is in the series Palgrave Studies in the History of Science and Technology–the principal reason for recruiting Palgrave as the publisher. The following chapter abstracts provide a concise description of individual chapters. Palgrave, now a subsidiary of Springer, sells individual chapters. Chapter one: “Maps and Patents” A simple streetcar transfer with a schematic map, patented in 1916, introduces the book. This example shows how claims describing the breadth of the patentee’s monopoly supplements the specification describing how an invention works. The patents system and conventional referred journals are parallel literatures, similar in several ways, including careful vetting by patent examiners or journal editors. Minimal cross-referencing between the two literatures reflects separate networks of creative people who differ markedly in work environment and sense of problem. The chapter also notes the importance of the U.S. Patent Classification system, used by examiners to find potentially conflicting inventions; the marked historical dissimilarity of trends in cartographic patents and patents in general; and the relevance of social science principles like the Theory of Multiples. Chapter two: “Pinpointing Location” Patented schemes for identifying rural places peaked well before patents addressing travel mapping and map folding. These schemes provided an alternative to the Public Land Survey System, and one anticipated by eight decades the “quadtree” data structure adopted for digital mapping in the 1970s. Particularly emblematic is the Clock System patented in 1915 by John Byron Plato to give rural residents a “real address,” just like their urban counterparts. Twelve sectors defined by lines radiating from each locally important central place were superimposed on concentric circles a mile apart, which divided the surrounding area into “blocks.” All residences within each block were assigned a unique number or letter to produce a rural address, which was listed in a “rural directory” published along with a map. Chapter three: “Showing the Way” Mechanical in-vehicle navigation systems anticipated the GPS by eight decades. By expanding the motorist’s geographic range, the automobile spurred demand for the strip map, a niche opened up by bicycle touring in the late nineteenth century. One inventor attached a strip map to a pair of rollers in a rigid frame mounted on the handlebar and showing only the most immediately relevant part of the route. Another attached a scrolling device to a car’s steering column, and others made scrolling automatic with a flexible cable attached to a wheel. Enhancements included warning bells and verbal directions from a phonograph mounted under the dashboard. Most of these patents were never developed commercially, and the market dried up around 1920 because of improved signposting and better roads. Chapter four: “Folding, Unfolding” This chapter begins with an explanation of basic principles of map folding. Although the U.S. Patent Office issued its first map-folding patent in 1889, these patents were relatively infrequent until the 1980s, when map-folding schemes such as the starburst and Z-card became more complex, more numerous, and more difficult to manufacture. After 1985 foreign inventors, always a part of the American patent system, became proportionately more prominent. These more recent map-folding strategies relied upon innovative machines customized for efficient mass production—machines that constituted a parallel stream of inventing and patenting bolstered this surge of map-fold patenting. With convenient compactness achieved, the wave subsided and innovative map folding became a dying art as patents expired and clever entrepreneurs turned to copyright’s more enduring protections. Chapter five: “World Views” The late John Snyder once observed that patenting a map projection was pointless because a similar projection can almost certainly be found, royalty free, in the public domain. Of the 2,551 projections in Snyder’s comprehensive Bibliography of Map Projections (1988), only fourteen were patented. These fourteen and seven others identified through visual analysis and the U.S. Patent Classification System largely confirm Snyder’s observation insofar as few of them were developed commercially and none produced significant income. Although several inventors obviously hoped to profit from their inventions, a more likely motive is the need for achievement: one of three basic needs (along with affiliation and power) that social psychologist David McClelland invoked, in his 1961 classic The Achieving Society, to explain human behavior. Chapter six: “Global Affairs” As physical objects that can be made and sold, globes are obvious candidates for patent protection. Mid-nineteenth-century patents typically focused on the globe’s frame or mounting, cleverly configured to show seasonal differences, mimic the precision of scientific instruments, and appeal to the education market. After 1900 globe makers shifted their attention to less complicated varieties marketed as decorations for homes and offices. Subcategories recognized by the U.S. Patent Classification reflect advances in enabling technologies such rubber manufacturing and electrical power, which gave rise to the inflatable globe in 1868, the illuminated globe in 1914, and the motorized, clock-driven globe in 1930. Increased filings after 1931 reflect more efficient production methods, and another group of innovative globes followed the launch of Sputnik I in 1958. Chapter seven: “Current Events” This chapter focuses on the development of electrically operated cartographic inventions before 1960. As early as 1910, inventors had devised clever ways for using electricity to make maps interactive. Examples include early electronic locator maps placed in kiosks for tourists or shoppers, and maps integrated with automated signaling systems for fire alarms and police calls. Later inventions provided instant feedback on a geography quiz or orchestrated the automated cutting of three-dimensional relief models for the military, which fostered the transition to interactive, online, and mobile mapping. In the digital era, map-related patenting shifted from independent inventors to the corporate sector, where multiple employees were often named as inventors, and patents became assets to be bought and sold as well as defensive weapons against infringement claims. Palgrave requires authors to solicit their own endorsements, also called blurbs, from well-respected scholars. I am fortunate to know a few, who responded with the following much-appreciated appraisals. whom I never met. He held a variety of jobs (including private detective and plant foreman) before becoming a full-time inventor, and was awarded several patents for bottle caps and crown-making devices. 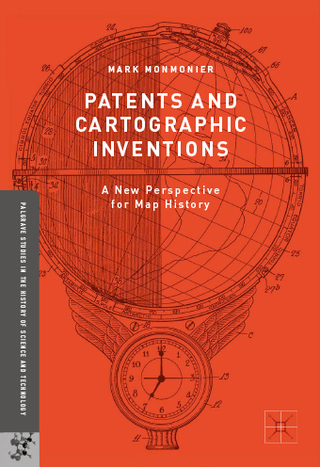 “Cartographic creativity: Patents awarded for printed maps between 1840 and 2012,” April 2014, AAG. “Stalking early twentieth-century cartographic inventors with Big Microdata,” April 2015, AAG. “Inventors and cartographic creativity: Map-related U.S. patents, 1880 – 2012,” July 2015, ICHC. “Cartography in the twentieth century: Revolutions, stories, and inventions,” November 2015, U of VT.
“Patented map projections: Intellectual property or mathematical narcissism,” March 2016, AAG. “Motives for patenting a map projection: Did fame trump fortune?” June 2017, ICA/IGU/LoC. “John Byron Plato: Inventor, entrepreneur, rural advocate, cartographer,” October 2017, NACIS.